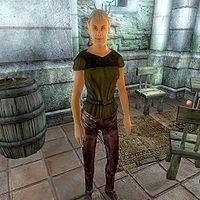 Adanrel is a Bosmer rogue who lives with Methredhel in the Imperial City's Waterfront District. She has few skills, is quite poor, and seems to have little property of her own; a fate she laments is shared by many other Waterfront District residents. Although Methredhel will eventually become a member of the Thieves Guild, Adanrel will not. Adanrel sleeps in Methredhel's house from 10pm until 6am. Skipping breakfast, she wanders around the house until 9am, when she starts work at the Imperial Trading Company Warehouse. She toils until 6pm, taking a two-hour break to eat lunch in her house between midday and 2pm. On weekdays (all days except Loredas and Sundas), she eats dinner between 6pm and 8pm at The Bloated Float Inn before returning home and pacing around her house until it is time to sleep again; on weekends, she simply stays at home. The two exceptions to this schedule are during the Misdirection quest, when all Waterfront District residents are confined to their homes, and during Light the Dragonfires, when the whole city is under martial law. Again, she is confined to her house. She wears lower-class attire consisting of a dark green shirt, laced leather pants and stitched leather shoes. She also carries the key to Methredhel's house and a meager amount of gold. In combat, she relies on an iron bow, an iron dagger, and either a Chameleon, Invisibility or Silence spell. When approached for the first time, she will introduce herself briefly: "I'm Adanrel. I'm discouraged." And when asked about the Imperial City, she will explain the sad situation for herself and the other workers on the Waterfront: "Lots of us on the Waterfront are down. We can't do that dungeon stuff like you adventurers. We got no money, and no skills. Nobody wants us."